Often the opposite of disruption is the status quo. 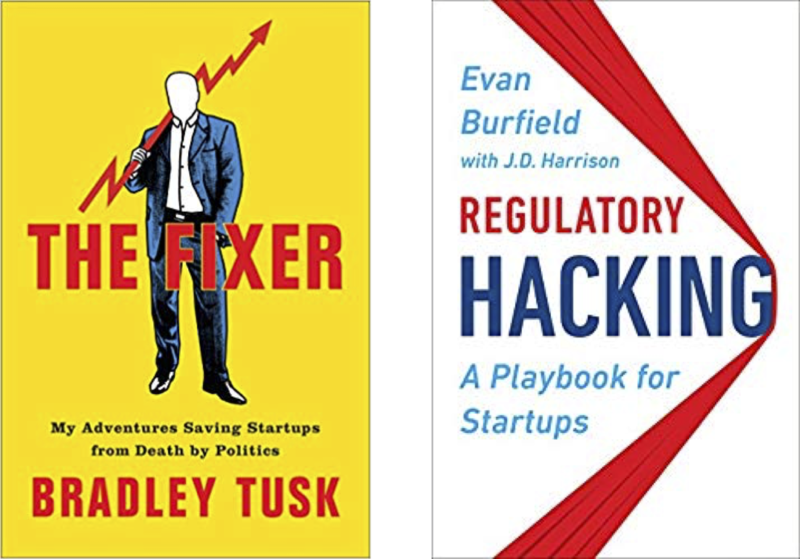 If you’re a startup trying to disrupt an existing business you need to read The Fixer by Bradley Tusk and Regulatory Hacking by Evan Burfield. These two books, one by a practitioner, the other by an investor, are must-reads. The Fixer is 1/3rd autobiography, 1/3rd case studies, and 1/3rd a “how-to” manual. Regulatory Hacking is closer to a “step-by-step” textbook with case studies. Here’s why you need to read them. One of the great things about teaching has been seeing the innovative, unique, groundbreaking and sometimes simply crazy ideas of my students. They use the Business Model (or Mission Model) Canvas to keep track of their key hypotheses and then rapidly test them by talking to customers and iterating their Minimal Viable Products. This allows them to quickly find product/market fit. Except when they’re in a regulated market. All businesses have regulations to follow – paying taxes, incorporating the company, complying with financial reporting. And some have to ensure that there are no patents or blocking patents. But regulated markets are different. Regulated marketplaces are ones that have significant government regulation to promote (ostensibly) the public interest. In theory regulations exist to protect the public interest for the benefit of all citizens. A good example is the regulations the FDA (Food and Drug Administration) have in place for approving new drugs and medical devices. In a regulated market, the government controls how products and services are allowed to enter the market, what prices may be charged, what features the product/service must have, safety of the product, environmental regulations, labor laws, domestic/foreign content, etc. local city and county laws come from local government. In the U.S. the national government has regulatory authority over inter-state commerce, foreign trade and other business activities of national scope and interest. Congress decides what things needs to be regulated and passes laws that determine those regulations. Congress often does not include all the details needed to explain how an individual, business, state or local government, or others might follow the law. In order to make the laws work on a day-to-day level, Congress authorizes certain government agencies to write the regulations which set the specific requirements about what is legal and what isn’t. The regulatory agencies then oversee these requirements. In the U.S. startups might run into an alphabet soup of federal regulatory agencies, for example; ATF, CFPB, DEA, EPA, FAA, FCC, FDA, FDIC, FERC, FTC, OCC, OSHA, SEC. These agencies exist because Congress passed laws. In addition to federal laws, each State has its own regulatory environment that applies to businesses operating within the state in areas such as land-use, zoning, motor vehicles, state banking, building codes, public utilities, drug laws, etc. Finally, local municipalities (cities, counties) may have local laws and regulatory agencies or departments like taxi commissions, zoning laws, public safety, permitting, building codes, sanitation, drug laws, etc. Startup battles with regulatory agencies – like Uber with local taxi licensing laws, AirBnB with local zoning laws, and Tesla with state dealership licensing – are legendary. Each of these is an example of a startup disrupting regulated markets. There’s nothing magical about dealing with regulated markets. However, every regulated market has its own rules, dynamics, language, players, politics, etc. And they are all very different from the business-to-consumer or business-to-business markets most founders and their investors are familiar with. Can I do anything I want or are there laws and regulations that might stop me or slow me down? Are there incumbents who will view us as a threat to the status quo? Can they use laws and regulations to impede our growth? 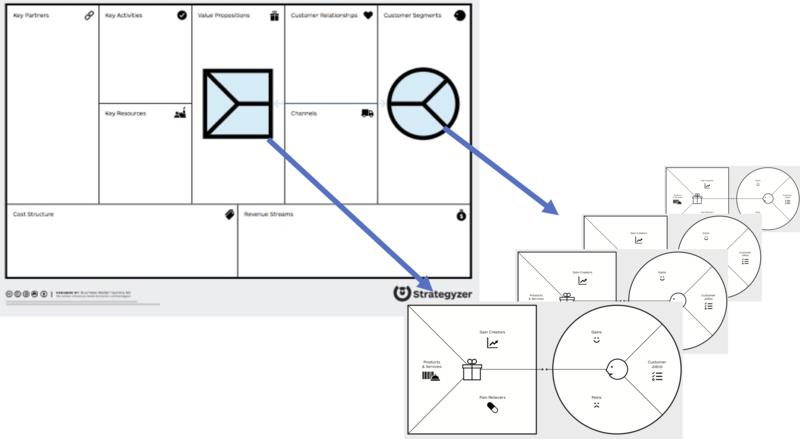 The best way to start is by drawing a business model canvas. In the customer segments box, you’re going to discover that there may be 5, 10 or more different players: users, beneficiaries, stakeholders, payers, saboteur, rent seeker, influencers, bureaucrats, politician, regulators. As you get out of the building and start talking to people you’ll discover more and more players. Instead of lumping them together, each of these users, beneficiaries, stakeholders, payers, saboteur, rent seekers, etc. require a separate Value Proposition Canvas. This is where you start figuring out not only their pains, gains and jobs to be done, but what products/services solve those pains and gains. 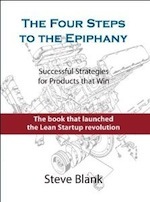 When you do that, you’ll discover that the interests of your product’s end user versus a regulator versus an advocacy group, key opinion leaders or a politician, are radically different. For you to succeed you need to understand all of them. 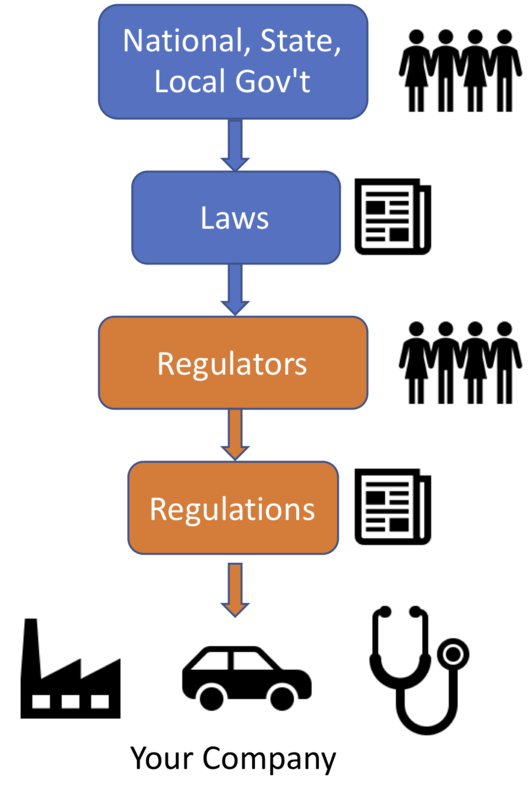 One of the critical things to understand is how the regulatory process works. For example, do you just fill out an online form and pay a $50 fee with your credit card and get a permit? Or do you need to spend millions of dollars and years running clinical trials to get FDA clearance and approval? And are these approvals good in every state? In every country? What do you need to do to sell worldwide? One of the unique things about entering a regulated market is that the incumbents have gotten there first and have “gamed the system” in their favor. Rent seekers are individuals or organizations with successful existing business models who look to the government and regulators as their first line of defense against innovative competition. They use government regulation and lawsuits to keep out new entrants that might threaten their business models. They use every argument from public safety to lack of quality or loss of jobs to lobby against the new entrants. Rent seekers spend money to increase their share of an existing market instead of creating new products or markets but create nothing of value. These barriers to new innovative startups are called economic rent. Examples of economic rent include state automobile franchise laws, taxi medallion laws, limits on charter schools, cable company monopolies, patent trolls, bribery of government officials, corruption and regulatory capture. Rent seeking lobbyists go directly to legislative bodies (Congress, State Legislatures, City Councils) to persuade government officials to enact laws and regulations in exchange for campaign contributions, appeasing influential voting blocks or future jobs in the regulated industry. They also use the courts to tie up and exhaust a startup’s limited financial resources. Lobbyists also work through regulatory bodies like the FCC, SEC, FTC, Public Utility, Taxi, or Insurance Commissions, School Boards, etc. Although most regulatory bodies are initially created to protect the public’s health and safety, or to provide an equal playing field, over time the very people they’re supposed to regulate capture the regulatory agencies. Rent Seekers take advantage of regulatory capture to protect their interests against the new innovators. For revenue streams figure out who’s going to pay. Is it the end user? An insurer? Some other third party? If it’s the government, hang on to your seat because you now have to deal with government procurement and/or reimbursement. These payers need a Value Proposition Canvas as well. For Customer Relationships, figuring out how to “Get, Keep and Grow” customers in a regulated market is a lot more complex than simply “Let’s buy some Google Adwords”. Market entry in a regulated market often has many more moving parts and is much costlier than a traditional market, requiring lobbyists, key opinion leaders, political donations, advocacy groups, and grassroots and grasstops campaigns, etc. Start diagraming out the relationships of all the customer segments. Who influences who? How do they interconnect? What laws and regulations are in your way for deployment and scale? How powerful are each of the players? For the politicians, what are their public positions versus actual votes and performance. Follow the money. If an elected official’s major donor is organization x, you’re not going to be able to convince them with a cogent argument. The book Regulatory Hacking calls this diagram the Power Map. 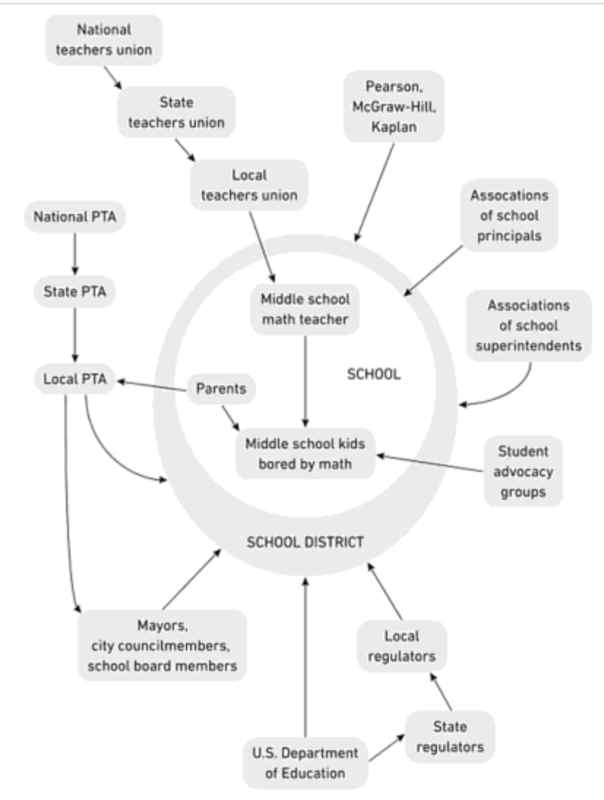 As an example, this is a diagram of the multiple beneficiaries and stakeholders that a software company developing math software for middle school students has to navigate. Your diagram may be more complex. There is no possible way you can draw this on day one of your startup. You’ll discover these players as you get out of the building and start filling out your value proposition canvases. Next, draw a competitive Petal diagram of competitors and adjacent market players. Who’s already serving the users you’re targeting? Who are the companies you’re disrupting? 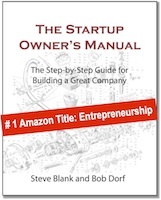 I’ve always thought of my startup as the center of the universe. So, put your company in the center of the slide like this. Fill in the market spaces with the names of the companies that are representative players in each of the adjacent markets. Finally, draw your strategy diagram – how will you build a repeatable and scalable sales process? What regulatory issues need to be solved? In what order? What is step 1? Then step 2? For example, beg for forgiveness or ask for permission? How do you get regulators who don’t see a need to change to move? And do so in your lifetime? How do you get your early customers to advocate on your behalf? I sketched out a sample diagram of some of things to think about in the figure below. Both The Fixer and Regulatory Hacking give great examples of regulatory pitfalls, problems and suggested solutions. If you read Tusk’s book The Fixer you come away with the view that the political process in the U.S. follows the golden rule – he who has the gold makes the rules. It is a personal tale of someone who was deep inside politics – Tusk was deputy governor of Illinois, Mike Bloomberg’s campaign manager, Senator Charles Schumer’s communication director, and ran Uber’s first successful campaign to get regulatory approval in New York. And he is as cynical about politicians as one can get. On the other hand, Regulatory Hacking by is written by someone who understands Washington—but still needs to work there. Great post Steve… It got me to thinking about the DoD as a regulatory system. As you know, the requirement to follow all of the legislative and executive requirements both in national defense and acquisition strategy is not unlike the commercial world requirements, minus the full profit agenda – mission model canvas notwithstanding. Yes. 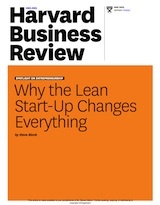 The framework is the same, but the DoD rules are even more complex for startups to follow. It’s why most investors have told them to stay away from doing business with the government. Hopefully some of the changes in the acquisition process will make it easier.